Back for a short tour in February 2016 it’ll be Jack’s first visit to the UK since 2013 and it promises to be a rare treat. Complete with a big band he celebrates one of the greatest singers of all time – Frank Sinatra. The dates coincide with the release of Jack's new album Seriously Frank celebrating 100 years of Sinatra. With 13 tracks, a 22 piece orchestra and piano from Dave Grusin, Seriously Frank combines some classic numbers with lesser known songs, all arranged and conducted by Patrick Williams. Rated by Frank Sinatra and Tony Bennett as numero uno, Jack Jones is something of a benchmark. He has 60 albums to his credit, two Grammies and another five nominations, an Emmy, and awards too numerous to mention. He has performed at two Royal Variety Shows and has his own Hollywood Walk of Fame star right next to his father’s, the film star Allan Jones. On fine form at 77, this is a man who has sung his whole life. As one of the very few original greats left standing, what better show for him to bring to the UK than ‘Jack Sings Frank’ – one legend’s tribute to another. And particularly appropriate since it was Frank that inspired Jack to sing. When at school Jack’s friend, Nancy Sinatra, brought her Dad in one day to sing at assembly… and from then on it was sports’ loss and entertainment’s gain. 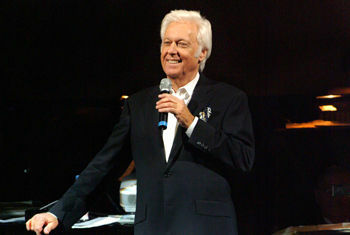 Born into a showbiz family (on the actual night his father, Allan Jones, recorded his hit Donkey Serenade), Jack started singing professionally at the age of 19 supplemented by his income as a petrol attendant. Signing his first deal with Capital Records in 1959, Jack went on to record with several labels over the years, 20 albums with RCA alone, and have 17 chart in Billboard’s Top 20. Perhaps best known for his hit renditions of The Impossible Dream, Lollipops and Roses, What I Did For Love, The Race Is On, Lady, Call Me Irresponsible and The Loveboat theme amongst others, he has also addressed the work of contemporary artists such as Randy Newman and Carole King. Consistently playing to packed houses worldwide, not to mention stellar venues such as Carnegie Hall, the Kennedy Centre and the White House, Jack Jones is an artist who truly knows how to entertain. This is one tour that promises to be superlative on every level.